Detainees in Libya’s al-Hamra migrant detention centre, one of nineteen official detention centres where migrants and asylum seekers are held, near the town of Gharayan, crowd the entrance to the shipping container where many detained for months on April 15, 2014. Detainees have described to us how male guards strip-searched women and girls and brutally attacked men and boys. The political situation in Libya may be tough, but the government has no excuse for torture and other deplorable violence by guards in these detention centres. 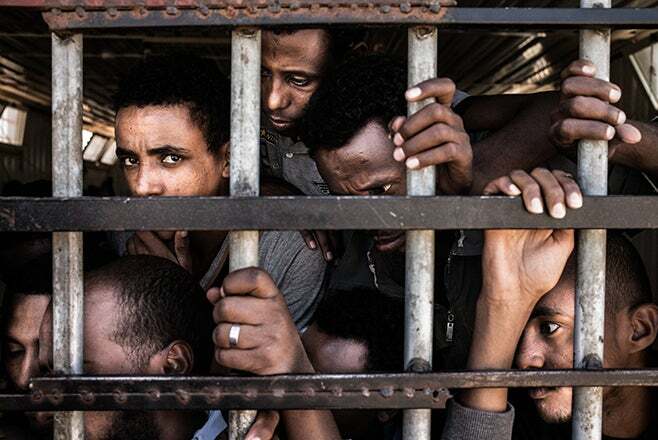 Guards in migrant detention centres under Libyan government control have tortured and otherwise abused migrants and asylum seekers, including with severe whippings, beatings, and electric shocks. Both the EU and Italy also support Libya’s detention centers by rehabilitating some centers and funding international and Libyan non-governmental organizations providing assistance there. The EU and Italy have committed at least €12 million over the next four years to the centers. Human Rights Watch visited nine of the centres – two for women, girls, and young boys and seven for men and older boys – and spoke with 138 detainees about problems they faced in detention. In eight of the centers – Burshada and al-Hamra, near Gharayan; al-Khums,100 kilometers east of Tripoli; Zliten, and Tomena, near Misrata; abu-Saleem and Tuweisha in Tripoli; and Soroman, 60 kilometers west of Tripoli – detainees spoke of serious abuses by guards. Some interviews were conducted in groups and others in private and confidentially. Posted on 26th June 2014 by newsafrica. This entry was posted in Africa, Arab Spring, Christainity, Democracy, Human Rights Violations, Islam, Libya, Race Relations, Religion, Terrorism and tagged European Union, Human Rights Watch, Italy, Libya, Refugee, Tripoli, United Nations High Commissioner for Refugees, United Nations Support Mission in Libya. Bookmark the permalink.